Fully compatible from Windows 95 OSR2 to Windows server 2008! You'll write your first program in a couple of hours without any headache. You can do near everything under Windows with few lines of code. Manual available in PDF format. 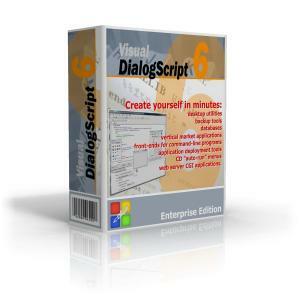 DialogScript.com Members have access to Forum based tutorials for more extensive use of Visual DialogScript. Easy yet powerful language set allows you to quicly learn and develop your needs. Spend a day developing your code instead of a month! You don't need a 4 year degree or a pHd to learn and understand Visual DialogScript! Everything you need is included, unlike some other development tools like this. So instead of paying $500.00 to $5,000.00 USD to get everything you need, you merely pay a small regisration fee and get everything in one package!